Vilamoura is a popular, vibrant tourist resort located just a short drive from Faro Airport. It is actually the largest private tourism resort in the whole of Europe, and is considered one of the most prestigious in Portugal. Many celebrities are known to come to Vilamoura, as well as those tourists who are looking for a spot of luxury when holidaying in the Algarve. One aspect that makes Vilamoura unique to the rest of the Algarve (as well as the rest of Portugal, come to think of it) is its luxurious, Vegas-style casino. Gambling is considered a crime in Portugal, but is accepted as long as people do so in a casino, resulting in thousands of Portuguese residents flocking to Vilamoura Casino when they fancy a game of poker. This isn’t to say that the casino doesn’t attract herds of tourists from all over the globe each year! Vilamoura is also recognized worldwide for its impeccable golfing facilities, and many package golfing holidays that are on the market are based in Vilamoura. There are a range of stunning golf courses suiting golfers of all abilities to choose from, such as Laguna, Millennium, Pinhal, Victoria, Vila Sol and The Old Course, which is the 2nd oldest in the region. Whether you’d like to play on a Championship layout or simply wind down with a relaxing spot of golf, there’s a course to suit everyone in Vilamoura. 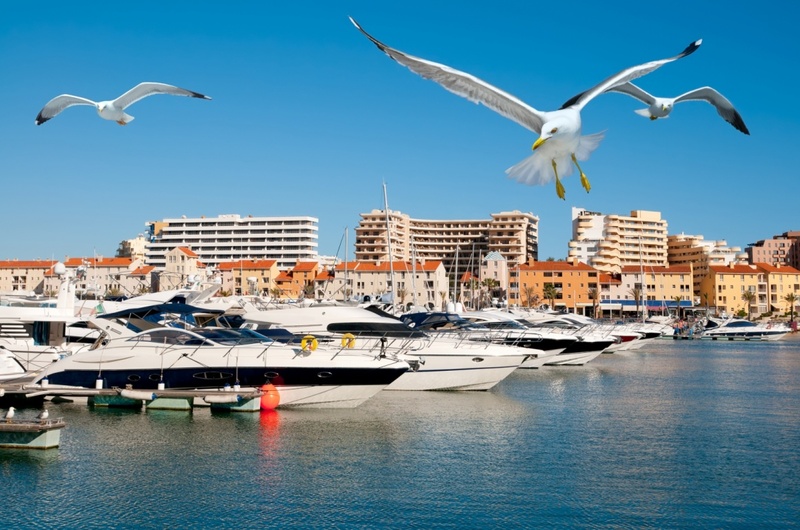 The ‘buzz’ of the resort is definitely centered in and around Vilamoura Marina, which has plenty of bustling bars and top-notch restaurants to sample some of the best dishes in the region. One of the restaurants that attracts many of Vilamoura’s ‘well-known’ visitors is Uniko. Try the seared scallops, marinated sardine fillets or the Algarvian escargot with parsley & garlic butter, or the mouthwatering honey glazed chicken breast. Fancy something a little more homely? Enjoy the wholesome British food at Parky’s Bar & Bistro. The resort is certainly among the top Algarvian nightlife hotspots. One of the more popular bars is Sete Café, which in Portuguese means ‘Café Seven’. It’s located right on the Marina, and is actually co-owned by football superstar Luis Figo. Sete Café has the unique ability to appeal a range of visitors from well-known celebrities to holidaymakers who are simply looking for a lively atmosphere and a top sports bar to see all the important games. You might even get lucky enough to be in the presence of footballers on holiday! Get a little closer to home and try a couple of Vilamoura’s best Irish pubs; The Irish Cabin Pub and O’Neills Irish Bar, where visitors can watch live music and sit on the deck perched above the Marina water. Whichever type of nightlife you choose, you won’t be disappointed. With both lively family bars and laid-back, cosmopolitan hotspots, Vilamoura is one of the most prestigious places to visit in the Algarve. Find information about selected Hotels, apartments and rooms in Vilamoura to choose the perfect place for your accommodation.